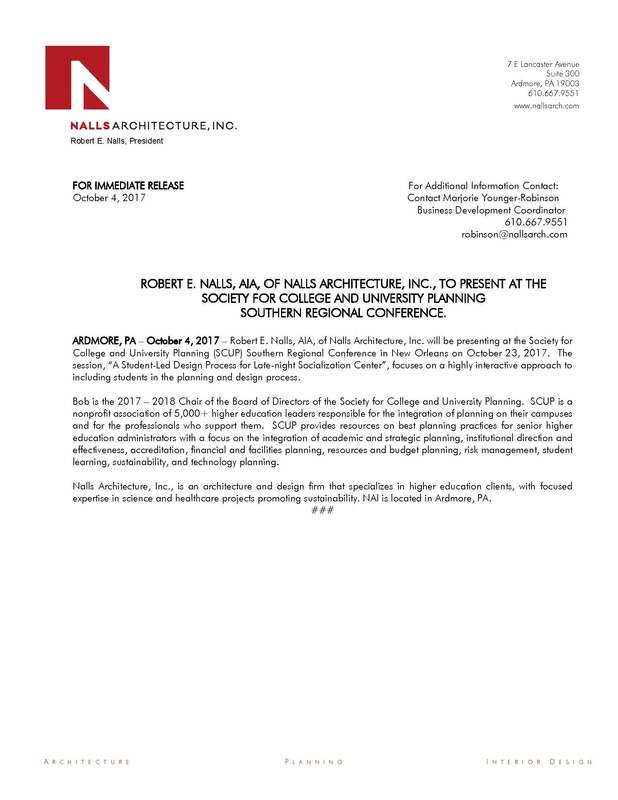 ARDMORE, PA – October 4, 2017 – Robert E. Nalls, AIA, of Nalls Architecture, Inc. will be presenting at the Society for College and University Planning (SCUP) Southern Regional Conference in New Orleans on October 23, 2017. The session, “A Student-Led Design Process for Late-night Socialization Center”, focuses on a highly interactive approach to including students in the planning and design process. Bob is the 2017 – 2018 Chair of the Board of Directors of the Society for College and University Planning. SCUP is a nonprofit association of 5,000+ higher education leaders responsible for the integration of planning on their campuses and for the professionals who support them. SCUP provides resources on best planning practices for senior higher education administrators with a focus on the integration of academic and strategic planning, institutional direction and effectiveness, accreditation, financial and facilities planning, resources and budget planning, risk management, student learning, sustainability, and technology planning. Nalls Architecture, Inc., is an architecture and design firm that specializes in higher education clients, with focused expertise in science and healthcare projects promoting sustainability. NAI is located in Ardmore, PA.